There is an exciting move in bathroom trends towards a more opulent feel and the good news is that it is easy to create the look in your bathroom, often by paying attention to the finishing touches such as the taps. We are seeing a lot more choice when it comes to finishes in taps and shower fittings. There are a host of new luxurious materials such as Copper and Crystal alongside Matt Black and Dark Nickel finishes that can transform your bathroom. Black is a bold statement to make in a bathroom but it creates a timeless, chic and elegant look, depending on the style you choose this can work for both modern and traditional rooms. 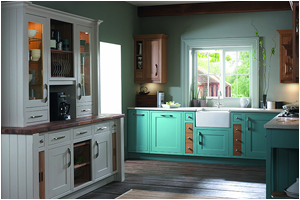 For example, the St James range from Marlow provides vintage glamour whilst other brands offer more contemporary shapes. The new Matt Black surface in the cutting-edge MPRO collection from Crosswater combines high-end specification with beautifully considered aesthetics to create brassware that stands out. The Marflow St James collection also offers some gorgeous Crystal which works extremely well for those looking for an Art Deco feel. Crystals are unashamedly glamorous, they add light to a bathroom and also make a good choice to match that chandelier you have always wanted in the bathroom! New metallics include Bronze, Brass, Copper, Gold and Nickel. These warm metal tones can be used to create an industrial look in the bathroom but are also very versatile, being at home in both modern and traditional designs. The finishes available vary from a soft Rose Gold to a more masculine Dark Nickel, providing plenty of ways to add a touch of class and colour to your bathroom design. 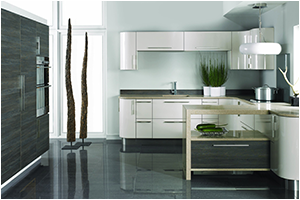 You can take the look further by adding other accessories in your chosen finish. Providing a contrast to white or neutral tiling on the walls, accessories are a great way to explore subtle inclusions of the black and metallic trends. From towel hooks to storage ladders and large circular mirrors, these accessories can complement and bring together the overall design scheme. Team your bold taps and shower fittings with reflective surfaces, sultry wallcoverings and striking furniture to create a room that excused sophistication. Why not call into the showroom, we have some of these exciting new finishes on display and we can start designing your perfect opulent bathroom.